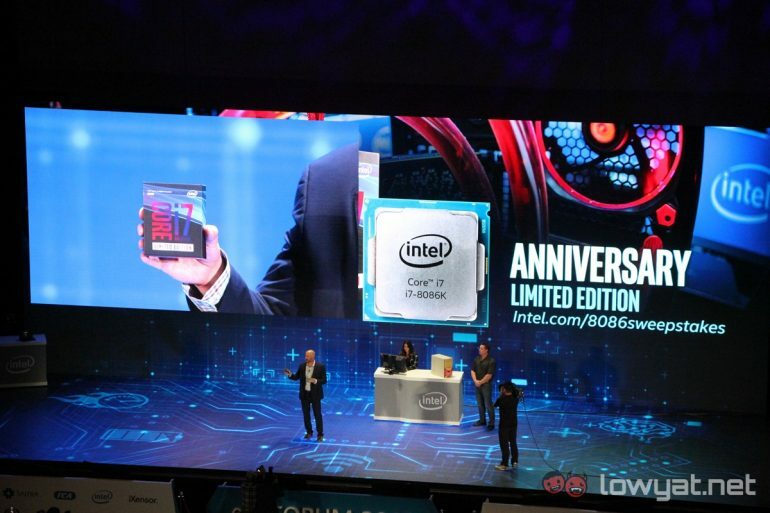 Intel officially launched its limited edition Core i7-8086K anniversary CPU during its keynote here at Computex 2018. The name of the CPU is in commemoration of Intel’s iconic 8086 processor; it was launched 40 years ago, and was the processor that kickstarted the x86 architecture. The naming convention indicates that the Core i7-8086K is an 8th Generation CPU. Speed-wise, the CPU ships out with turbo clockspeed of 5GHz, with a base clockspeed of just 4GHz. Naturally, because this CPU is a ‘K’ variant, the CPU can be further overclocked beyond the 5GHz mark. Intel did not provide a retail price for the Core i7-8086K, but did state that it will only be making 8086 of these CPUs for sale. It was not said if the CPU would be available for purchase in Malaysia.